The legendary Professor STEPHEN HAWKING. 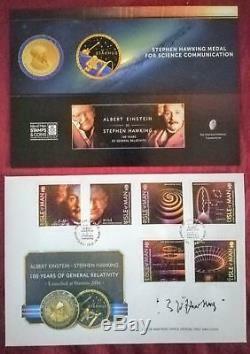 Autograph - his official stamped signature - on First Day Cover from "Einstein to Stephen Hawking". Have never seen another one like this. 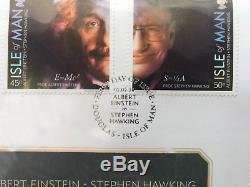 As Hawking could not write, he authorized on very rare occasions that a stamp of his autograph was used by his Cambridge office. This is one of the rare items with the stamped signature. The only signed First Day Cover of him that I have ever seen -- probably unique!! And probably the best association possible: the two geniuses of the 20th century - Einstein and Hawking. 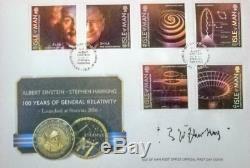 The item "Einstein First Day Cover signed by Prof. Stephen Hawking" is in sale since Friday, November 2, 2018. 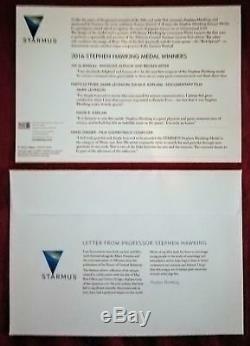 This item is in the category "Collectables\Scientific Collectables\Other Scientific Collectables". The seller is "*caligulix*" and is located in Bad Wiessee. This item can be shipped worldwide.